I wonder what it would be like to be a formal student of photography. I’ve become enthralled informally. 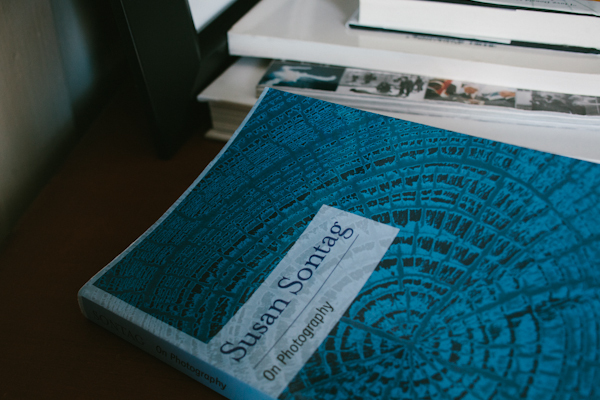 I sit at my laptop ordering the next stack of books from amazon, all loosely to do with photography. Learning about the world, feminism, foreign countries, culture, history, politics, in context of the lens. I don't think being a formal student could possibly be as fun. My amazon surfing addiction led me to Susan Sontag a week or so ago and I finished her collection of essays On Photography not long after. Since then mostly for fun I've been re-reading, highlighting some her ideas. I've been thinking about the philosophy behind photography, photography culture, and the culture of photography. What I photograph, how I photograph, and what is happening to the photographs as they find their way out into the world via the internet, or in print. Photographs up for interpretation, must like the essays themselves. Yet a photograph is only a small piece of the world. 1/1000th of a second of a reality that is given distance to in time and in physical space at the moment the shutter is released. A photograph does not explain, only acknowledge, and that is claimed by Sontag as both the tragic flaw, and what constitutes the attraction to the still image. “only which narrates can be understood. The limit of photographic knowledge of the world is that, while it can goad conscience, it can finally never be ethical or political knowledge. The knowledge gained through still photographs will always be some of sentimentalism, whether cynical or humanist. It will be knowledge at bargain prices - a semblance of knowledge, a semblance of wisdom... the very muteness of what is." -Susan Sontag, On Photography. The nature of the image is ingrained within society, as well as photography as a social rite; family photos, wedding photography, touristic snapshots, across the world are documented. My job, my work, relies on this knowledge. Taking a photograph can create an event, though it is not necessary to an event itself, it produces a second experience, the view and interpretation of the event. The experience, and the image of the experience. The latter a silent description, and therefore, inherent to the nature of photography, incomplete. Susan Sontag finally speaks to beauty versus truth, and beauty as truth as the ultimate motivator to the making of a photograph. She talks about realism and the forged realism of photography in recent decades. How a photo is interpreted as truth, and how photographic seeing is the ability to find beauty within the ordinary, or mundane, or in connections, beauty in relation to other things. This circles back to the camera’s ability, or photographic vision to transform reality into something beautiful, which then consequently weakens a photos ability to tell the truth. If we infer not everything can be beautiful. On Photography challenged a lot of my ideas and my own philosophy and approach to photography. It made be question how I photograph; the precise act of knowing vs the intuitive encounter, (Sontag, 116) and why; a moralized idea of truth telling. (Sontag, 86) It made me entertain ideas that are glossed over in the world of wedding photography; ethics, beauty, the invitation to sentimentality, as well as the instant romanticism of the digital age and how that relates to my own documentary and personal work. Sontag writes a clear picture of the photographs role in our society from the pre digital era, and still her ideas spark discussion and understanding today. As photographers and as the photographed we live in the age of the image.